Home > Headwear > Baseball Caps > Richardson - Trucker Snapback Cap Baseball Hat - 112 - 67 Colors! 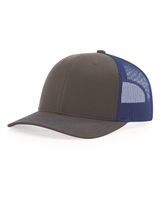 Richardson - Trucker Snapback Cap (112) 65/35 polyester/cotton. 100% polyester mesh back. Structured, mid-profile, six-panel. Pre-curved contrast stitched visor. Snapback closure. Prior to purchase feel free to contact us to check stock. These go in and out of stock very quickly. support@halfzipped.com. Thank you.